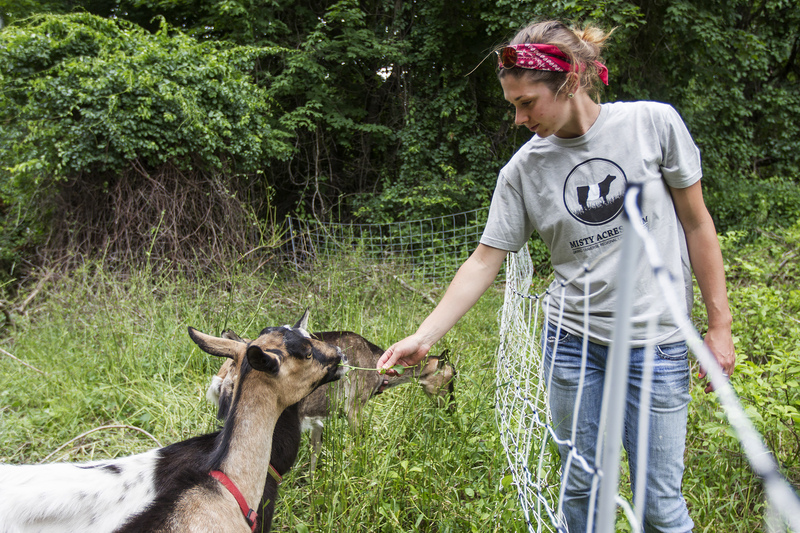 ARCADIA, Mich. — Deep in the Benzie County woods, tucked away behind brambles and brush, a small herd of domesticated goats is hard at work doing what those creatures do best: eating everything they can reach. Seven retired milk goats owned by the Grand Traverse Regional Land Conservancy consume various invasive species within a quarter-acre electric pen set up to contain them, re-positioned every week to keep up with the voracious resurgence of the site’s plant growth. The goats work an old homestead now part of the Arcadia Dunes preserve, using their appetite to keep in check plants once used for a home’s decoration now grown out of control — to the detriment of native vegetation. Further into the woods at the preserve site is a wetlands area that provides ideal native orchid habitat. The conservancy’s goal is to protect that habitat by keeping the invasive plants from completely taking over, Griffin told the Traverse City Record-Eagle. On the goats’ menu at the preserve is autumn olive, multiflora rose, barberry, garlic mustard, Oriental bittersweet and creeping myrtle, sometimes called periwinkle. These types of invasive plants don’t appeal to native wildlife, such as deer or small mammals, but the goats seem happy to consume every green leaf they can reach. And reach they do. Griffin said the goats are named Dynamite, Deja vu, Dandy, Cardamom, Ducky, Dee Dee and Clyde, the latter being the matriarch or “boss lady” of the small herd. The goats remain in their movable enclosure at the preserve through the growing season and spend the winter months at Misty Acres Farm, a preserve and working farm nearby in Manistee County that also is protected by the conservancy. A fleet of volunteers takes turns with daily visits to the goats to bring them water, check the animals’ condition and ensure no problems arise with the enclosure. Griffin visits the goats every few days to decide when and where to relocate their pen — in other words, where invasive plant growth needs the most immediate attention. This is the second year the conservancy has kept the goats at the preserve. Another benefit to the goats’ activity is thanks to the ruminants’ four-chamber stomachs which use a fermentation process in digestion, Griffin said. The theory is invasive plant seeds that pass through the goats’ stomachs become less viable once excreted. The goats’ wild-grown diet is even better for them than the hay they eat through the winter. Their coats grow more sheen after being in the field and “even their mood improves,” Griffin said. Jennifer Jay, the conservancy’s communications director, said the goats are incredible for the agency’s volunteer program. The conservancy can boast a roster filled with hundreds of volunteers, she said. Jay said the conservancy’s volunteer program is going so well the nonprofit now plans to hire a full-time volunteer coordinator.